I’ve been so enjoying Yonder Way Farm’s pork chops that I had to post something about it. All the pork from them is delicious, but these prime thick cuts are just heavenly and worth every penny. I’ve taken to salting/flavoring them 24 hours before cooking them. I usually use a mixture of thyme, sage and pepper to flavor them along with kosher salt. I then cook them sous vide to an internal temperature of about 140F. Right before serving I sear them in a blazing hot cast iron skillet filmed with a little grapeseed oil (making sure the fat edge gets some pan-time) until they develop a browned crust – maybe 2 minutes total. 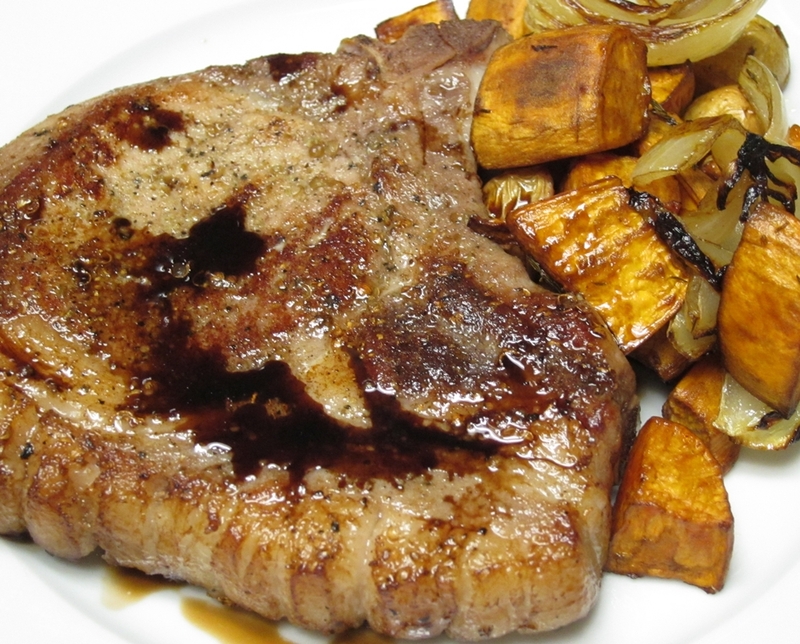 The result is one of the most delicious juicy chops anywhere. This one here is served alongside roasted sweet potatoes and drizzled with a little maple vinegar.